​If you are located in the United States, check out the review page on LED Grow Lights available in the US​. When purchasing LED ​plant lights, one of the key specifications to take into account is the range of light wavelengths that ​an LED grow light emits at. Plants use specific wavelengths of light to grow and so ensuring that your LED grow light of choice covers the full spectrum of light wavelengths required by plants is important to growing success. However, as the science of plant biology has not yet been completely deciphered, it is often not totally clear what the exact wavelengths of light and in what proportions ​they should be incorporated into an LED grow light for the best plant growth. Add to that, different species of plants will have evolved to use slightly different ranges of light wavelength can make for an often confusing picture. PlatinumLED (a.k.a. Platinum LED) is a recent newcomer to the UK market, having come over from the good old US of A. Finally, it's good to see that our choice of decent LED grow lamps in the UK is increasing and we might just be starting to see the level of choice the Americans have been treated to these past few years. In the US, PlatinumLED grow lights are one of the more popular consumer brands on the market and have been very well received. 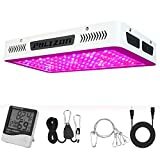 Platinum LED itself is a family-run business using 'Fulfilled-By-Amazon' or FBA, meaning that the LED grow lights are shipped to a UK Amazon warehouse for sale here so even though the seller is based in the US, ordering the item is as quick and easy as ordering an item from any UK-based seller. The lights themselves are well designed and the build quality is excellent. But by far the biggest positive with these lights is in their light emission spectrum. Unlike many of the lights in the UK, these Platinum LED lights include UV and Far-Red/IR LED bulbs complementing their array of red and blue LED grow bulbs making up a wide 12-band wavelength spectrum optimised for plant growth - and they DON'T contain any white LEDs which is another big positive. In addition, with many LED ​plant lights, you can never be quite sure of LED bulb quality, but with Platinum LED, you can at least rest assured that these lights use high-quality Bridgelux bulbs (NB: although the bulbs are made in the USA, the light itself is manufactured in China). Another unique feature of these LED grow lamps is their ability to modify the spectral settings between vegetative growth (higher proportion of blue light) and the promotion of the flowering stage of plant growth where they increase the proportion of red light. As with other LED grow lights, PlatinumLED also run their LED bulbs at a lower power output than their maximum-rated wattage of 3W in order to keep the bulbs running at a cooler temperature and therefore preserve their lifespan - but even at this power level, that is more than sufficient to cover the growth area the lights are designed for. ​For the more professional indoor grower, PlatinumLED also sells bigger LED plant grow lights, most of which are now available in the UK (see table below). On the more negative side, don't expect the fans to be 'whisper-quiet' as the seller has advertised - no decent consumer-grade LED grow ​lamp can run without cooling fans that are not dissimilar to the ones you find in any desktop computer - in other words, there is always going to be some fan noise. But overall, we would say that PlatinumLED lights ​are currently one of the best available options for quality LED grow lights in the UK! KINGBO LED grow lights are another brand of led grow light aimed at the regular consumer. KINGBO lights are designed and manufactured by the China-based Shenzhen Guangpushang Network Technology Company, which makes a few different lines of LED grow lights under the KINGBO brand. From this list, one can see that the KINGBO dual lens series emit light in the blue (400-495nm), green (495-570nm), yellow (570-590nm), red (620-710nm), and far-red (710-850nm) regions of the light spectrum. The lights also include some white LEDs (with colour temperatures of 3000K and 4500K), which are most likely there to ensure that any visible light wavelengths less well-established as being important for plant growth are not missed (and also possibly for aesthetic reasons too). Interestingly, although the marketing material for the dual optical lens ​series lights indicates that they cover the UV part of the light spectrum as well, no actual LED bulbs included in the lights target the sub-400nm wavelength range. Indeed, looking at the emission spectrum ​for the series confirms that there is very little, if any, true UV light (less than 400nm) ​emitted, so in this regard the company has got its advertising slightly wrong. ​One nice feature on the KINGBO Dual Optical Lens series ​is the presence of separate bloom and vegetative settings that can stimulate different stages of the plant life cycle as required, providing greater control to the indoor gardener. Build-wise, the KINGBO dual lens series ​lights also display​ excellent build quality, while delivery of the lights occurs in well-packaged boxes using discreet packaging. As with most LED Grow lights, the dual lens ​series lights do produce some waste heat but nothing over the top and are much cooler than more traditional forms of plant grow lighting. The KINGBO lights are also super bright, so much so that it is advisable to use protective eyewear if staying in the same environment as the lights for any extended period of time. The high light intensity also means that one has to pay particular attention to the distance at which these lights are hung above the plant canopy. This is to ensure that leaf burn or other light-induced plant damage is avoided particularly ​when using them on the more vulnerable greenery such as seedlings. A final major advantage of the KINGBO lights and the KINGBO brand in general that is worth mentioning is the high level of customer service one gets from the company when dealing with any issues surrounding their products. The customer service team is highly responsive and this is one of the major reasons why their review ratings are so high. Of course, no consumer LED grow light is ideal for all circumstances, and the KINGBO Dual Optical Lens series lacks the ability to daisy chain between individual lights so that one light can be provide power to a neighbouring unit when several are used together in a single growing space. Not having a daisy-chaining feature means that separate power sockets are needed for each and every light used in a grow area, and this can become inconvenient in a hurry especially in larger growing spaces. Finally it should be noted that the cooling fans on the KINGBO dual lens series lights are not as ‘whisper-quiet’ as advertised, however, they are not overly noisy either and are barely audible from outside an enclosed grow tent or growing area. Overall, the KINGBO Dual Optical Lens series are some very good LED grow lights to own but bearing in mind a couple of minor shortcomings. Another recent newcomer to the UK market are the VIPARSPECTRA LED grow lights. These lights come in a range of sizes in the UK from the small 300W LED grow light, the V300, the medium-sized 450W and 600W VIPARSPECTRA lights (the V450 and V600, respectively), ​to the big 900W ​devices, the V900 and the R900. ​The VIPARSPECTRA grow lights ​stocked here in the UK are well-built fixtures ​sporting 5W LED grow bulbs of a decent pedigree (​the bulbs are manufactured by​ the US company Bridgelux and the ​less well-known, but still reputable, Taiwanese company EPILEDS Technologies Inc (not to be confused with the Epistar goliath)). Apart from the 300W (V300), all the ​bigger lights in the VIPARSPECTRA range have the ability to prioritise either vegetative growth or flower / fruiting production. For instance, in the case of the 450W (V450), the vegetative growth setting uses approximately 100 Watts of electricity ​with just under half the bulbs on. ​​​For flowering and fruiting, turning on both the ​bloom ​setting together with the vegetative lighting on the LED grow light most likely provides the best flowering / fruiting yield ​from plants. Under these conditions, all the LED bulbs are on and the light draws approximately 200 Watts, equivalent to two incandescent bulbs of yesteryear. ​Turning on the ​bloom setting alone without ​turning on the bulbs for vegetative growth is unlikely to produce ​a higher yield as plants still need the blue wavelengths during this phase of their life cycle as well. However, having ​the ability to turn on just the flowering bulbs increases the versatility of the VIPARSPECTRA grow lights, allowing them to ​be used ​instead as just 'bloom booster' additions to any other grow lighting that you may already have. One of the unique and useful features of the VIPARSPECTRA grow lights is the ability to 'daisy-chain' individual lighting fixtures together. By plugging only one light into the mains electricity and then daisy-chaining subsequent lights in series off this initial light, you end up using only one mains power socket. This is particularly useful if you have (or intend to have) a large growing setup with multiple grow lights, as it becomes much less cumbersome to deal with all the wiring. However, it should be noted that this feature is understandably absent from the bigger 900W (V900 and R900) models. Update November 2018: Currently, the versions of the VIPARSPECTRA grow light with the daisy chain feature are not available in the UK at the moment. 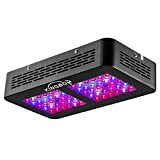 ​At the time of writing, only the 300W VIPARSPECTRA light supports daisy chaining, while the 450W and 600W VIPARSPECTRA LED grow lights available on Amazon UK ​​​no longer ​possess the daisy chain outlet normally found on the rear surface of the light fixtures. This may be ​associated with redirection of some European stock as the 450W and 600W lights currently come with European style electrical plugs as opposed to UK ones. ​VIPARSPECTRA lights produce relatively little heat which is adequately dispersed by the internal cooling fans, however, using them in an enclosed space like a grow tent will raise ​its temperature ​a little which may then require ventilation. ​As for noise levels,​ like other higher quality LED growing lights, ​fan noise is hardly perceivable when used within a grow tent or similar, but the fans ​are sufficiently noisy that you would not want to use them in any exposed personal living space. ​One other ​point to note is that the lights are very bright and ​some users have recommended using specialised eye protection when working under their glare to prevent ​any ​risk of eye irritation and headaches. The only minor negatives with the VIPARSPECTRA lights are the lack of coverage in the UV ​end of the spectrum, and the ​inclusion of white LED bulbs. The need for UV for plant growth is debatable as many-a-plant has been grown indoors ​successfully without UV. However, plants have evolved over millennia in the presence of constant and powerful UV from the Sun and some internal plant processes may occur better under UV wavelengths. ​As for the presence of white LED bulbs in the grow lights, if you want to know why we prefer not to have them, then see ​the review of white LEDs here​. However, this is not a deal-breaker by any stretch as plants have ​ultimately evolved under 'white' sunlight and ​the majority of consumer LED grow lights incorporate white LEDs to ensure that they are ​covering ​all the essential elements of the visible light spectrum. ​The VIPARSPECTRA brand itself is owned by the Chinese company, Shenzhen Bailuo Technology, that primarily specialises in selling LED lighting. The company is super-responsive and it is clear from both the quality of their products and the support they provide that their aim is to build a good reputation amongst their customers, which up until now, ​appears to be succeeding. 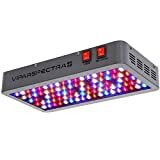 Once again the VIPARSPECTRA lights are available on good old dependable Amazon through ​its FBA program meaning that the lights are stocked here in the UK. Overall, given their quality, features and ​relative low prices, these grow lights are highly recommended. ​Another LED grow light recently made available to the UK consumer that should be considered when looking to buy a grow light is the Telos range of LED grow lights designed and manufactured by the UK company, GN. The GN Telos grow lights have a number of unique advantages over competitor products. First of all, they are manufactured in the UK itself, unlike many other competitor lights which are often manufactured in the Far East. Consequently one can rest totally assured that the lights are built to the highest possible standard when it comes to quality and safety. Indeed, G​N has spared no expense with regards to the quality of the components used in their LED grow lights, where they have used top-flight LED bulbs manufactured by the world-renowned LED company, Cree, as well as electrical components all of which are sourced from reputable companies. The Telos LED grow lights are also designed to be waterproof and dust-proof up to an IP rating of IP66, and the outer components of the lights have been selected for their UV and corrosion-resistance. This means that the Telos lights are very robust and can not only be used indoors and in higher humidity grow rooms but also used outdoors as supplemental LED grow lighting in greenhouses where electrical fixtures ​have to be UV-resistant and waterproof. ​However, by far the most important advantage that Telos lights have over other grow lights designed for the consumer is that Telos LED grow lights are fanless and have no moving parts, instead incorporating a large heat sink that keeps the LED bulbs cool via passive convection. This means that the Telos lights are not only less power-hungry but they are also super quiet compared to other consumer LED growing lights where the vast majority of the noise they generate is due to the operation of their internal fans. Fan noise is often a major obstacle for indoor gardeners since quite often grow rooms are situated very close to or within living spaces, so having a grow light that makes practically no noise is a major positive. Since the Telos lights have no moving parts, it also means that they are super reliable and long-lasting. In fact, almost everything about the design of the Telos lights has been optimised for longevity, for instance, the individual LED bulbs in Telos lights are run at a significantly lower power then their maximum power rating, thereby extending their rated lifespan to 85,000 hours (approximately equivalent to 10 years). Another example of long term thinking is in the Telos light’s upgradable design where they have made use of pressure seals and twist lock attachments instead of permanently sealing and bonding components together. This allows for future upgrade of individual parts of the lights with more advanced components that have not even yet been designed. ​The Telos lights favour the use of white LEDs which make up three-quarters of the bulbs used in the lights. Due to the quality of these Cree bulb-based LED grow lights, one can rest assured that the white light covers the full spectrum of wavelengths needed by plants for growth, however, they will also include some wavelengths of light that have been suggested to be inhibitory for plant growth, however, this represents a minor disadvantage considering all the positives one gets when using this light. The remaining bulbs used in the lights emit in the red part of the light spectrum at a wavelength of 660nm, incorporated to maximise the flowering and fruiting stages of the plant life cycle. ​Price-wise, the GN Telos range of ​plant grow lights are not cheap especially when compared to other consumer LED grow lights that are available in the UK. However, if you are a serious long-term grower, going for a higher quality light that should last a very long time may well be worth spending the extra cash. ​Overall, the GN Telos range of LED grow lights, with their fanless design, Cree bulb pedigree, and high-quality UK manufacturing are ​one of the best choices for the indoor gardener, and potentially represent the next iteration in the evolution of consumer LED grow lighting in the UK. ​Another relative newcomer to the UK LED grow light market is the Hipargero brand. The Hipargero series of LED grow lights represent part of a growing trend ​of consumer ​LED plant lights incorporating multicolour COB (chip-on-board) LEDs instead of single wavelength LEDs as their main source of light output. In the case of the Hipargero lights, they do still incorporate some single wavelength SMD LEDs in order to enhance some parts of the light spectrum but the COBs ​remain the main source of light. One of Hipargero’s most popular lights, the 450W HG450 consists of four 100W COBs plus 10 red SMD LEDs. Literature accompanying the HG450 indicates that the light emits in a wide range of light wavelengths ranging from 410nm to 730nm with light coming from 1200K (red wavelengths), 3000K (orange wavelengths), and 5000K (light blue wavelengths) COBs supplemented by ten 660nm (red) LEDs. We tested the HG450 with a spectrometer and confirmed that the light does indeed cover, for the most part, the broad range of wavelengths it claims to cover. ​The HG450 has only a simple on / off switch and does not provide any facility to ​tailor ​light output for vegetative ​or bloom ​growing conditions. The light is pleasingly bright and has a more natural whitish/pinkish look to it compared to other LED grow lights however, one does worry that some of the wavelengths emitted from the multicolour COBs that make the light pleasant for us humans to look at may not be optimal for what plants ​require...although this topic is hotly debated! The light itself is smaller than it looks in the advertised pictures but it does appear to be a well-built device with a body made from aluminium and plastic which has a high-grade feel to it. The whole unit is cooled by two fans which take in cool air from the rear of the unit and expel the warm exhaust air from vents located at ​either end. The light runs relatively cool with the body remaining just warm to the touch, however the front transparent screen does heat up quite noticeably although it is still cool enough to touch without burning yourself. Some users have suggested removing the front panel in order to enhance cooling and prolong the life of the LEDs, which may not be a bad idea, however one would then have to be very careful when handling the light not to inadvertently touch the LEDs especially when the light is on. The ​HG450 as a whole consumes about 200W of power, ​while noise-wise, the ​the unit is relatively quiet and is almost inaudible when placed within a closed grow tent. Recommended hanging heights for the HG450 are 60cm above plants for vegetative growth in a 90cm x 90cm area or 45cm high for flowering induction over an area of 60cm x 60cm, both of which seem reasonable given the strength of the light. ​​For the neighbour-shy, the light comes in a discreet brown box with a small label attached to the outside indicating the contents, and this box itself is then enclosed within an Amazon box which gives no outward indication of its contents. Inside, you get the LED light itself, together with metal hanging hooks as well as an undocumented bonus rope ratchet hanger (see pic) to facilitate the raising and lowering of the light. The HG450 also comes with a power cord fitted with a UK plug when bought in the UK. ​Hipargero has favoured the use of quality brand-name components inside their grow lights with the COB LEDs on the HG450 sourced from epiLED and the 5W SMD LEDs obtained from Cree, both of which are very reputable companies and making some of the highest quality components in the LED space. Hipargero itself is a Chinese entity that is selling its lights in the UK via Amazon’s FBA program which sees products stored and distributed from UK warehouses. Overall, the Hipargero HG450 LED grow light is an excellent little light that makes a big impression based on build quality and light output, and from what we have seen so far, we would recommend using one for a small grow area. ​The Mars Hydro brand belongs to a Chinese manufacturer called LG-LED Solutions Ltd based in Shenzhen. But don't be put off by thoughts of long-distance shipping, ​Mars Hydro has had the foresight to place stock in the UK, which avoids the unpredictability of international travel, and delivery times are the same as with any other UK-based product. The company itself sells a whole range of LED grow lights in a variety of sizes, meaning that they are committed to producing grow lights that are effective, and the reviews of their products suggest they do indeed work as desired. ​​One of the nice things about LED grow lights from Mars Hydro is that they make use of LED bulbs from Epistar​. Epistar is one of a handful of reputable companies that make LED bulbs that are consistent and reliable. Mars Hydro grow lights ​contain the more powerful 5W LED bulbs, which tend to ​run hotter​ and have a shorter lifespan than their more common 3W brethren. However, the power consumption of ​a Mars Hydro light is much lower than the sum of the power ratings of the individual bulbs contained within ​it, so for instance, a ‘300W’ lamp containing 60 x 5W bulbs will only consume 129W of power. This is one way that Mars Hydro gets around the lifespan issue with the 5W bulbs. By running 5W bulbs at only partial power extends their working life to at least as long as the lifespan of 3W bulbs and maybe even longer. Running the bulbs at lower power also ​means that less cooling is required, ​which in turn means that fan ​power consumption can also be kept to a minimum. Mars Hydro grow lights currently come in three different series. Firstly, you have the ‘Mars Hydro’ LED grow lights which have been sold by the company for a couple of years now and have proven to be quite popular with amateur growers. Then you have the newer ‘Mars II’ series which has some upgraded features and ​ a wider range of lights to choose from. ​Finally, in more recent times, the company has released the Mars Hydro ECO series of grow lights which can be seen almost as a cross between the ​original Mars Hydro series and the Mars II series of grow lights as the new ECO lights ​have adopted characteristics from both older lineups. ​​The oldest series, the Mars Hydro LED grow lights, consists of two lights, the 300W light fixture and the 600W lamp. The 300W lamp consumes 129W of power while the 600W lamp consumes 272W of power. The energy used is consumed mostly by the 5W LED bulbs of which there are 60 in the 300W lamp and 120 in the 600W lamp. The LED bulbs emit light that covers the blue and red parts of the visible light spectrum in the 430 - 475nm wavelength range for blue light and the 620 - 670nm range for red light. The lights​ also include LED bulbs that emit white light in order to ensure all parts of the photosynthetic light spectrum are catered for. The white light also has the advantage of making the light produced more aesthetically pleasing to the human eye as well as to allow for clearer plant inspections. The 300W lamp physically occupies an area a bit bigger than an A4-sized piece of paper and is designed for light coverage of a growing area of about 2ft x 2ft, or approximately a small 'dining table'-sized area, while the 600W lamp ideally covers a grow area of 2.5ft x 3ft. One disadvantage with this Mars Hydro series of lights is that if you want to cover a larger growing area ​by using several of them side-by-side, then multiple power sockets are needed to power each individual light separately. Overall, the Mars Hydro series of LED grow lights today is considered a little dated now but the lights have proven their worth over time and are especially good for the household gardener on a budget who only has a handful of plants to grow indoors. ​​The Mars II series from Mars Hydro was released just over a year ago and although several lights were ​ initially launched, ​today not all Mars II units are so readily available. As with the earlier series of lights from the company, the Mars II ​series makes use of 5W Epistar LED bulbs that primarily cover the red and blue parts of the light spectrum together with some white LED bulbs thrown in for good measure. However, the lights within the series do not necessarily make use of the same bulb types, so for example, while the 400W Mars II light fixture has LED bulbs that cover the 440-460nm wavelength range of blue light, the larger 900W and 1600W Mars II light fixtures from Mars Hydro have a wider range of blue light wavelengths starting at 400nm, ​which is ​​almost in the UV part of the light spectrum. Another difference between the lights is the incorporation of far-red LED bulbs, emitting light in the 730-740nm range, ​which are present in the larger lights but not so in the smaller 400W ​unit. ​Meanwhile, the red light wavelength range of 630-660nm is the same for all lights. As for coverage, the Mars II lights in the series can individually cover an ideal grow area of at least 3ft x 3ft right up to 5ft x 5ft for the biggest 1600W lamp. However, several lights can be used side-by-side to cover an even larger area and one of the key advantages that Mars II lights have over the older Mars Hydro series is ​the incorporation of an extra power socket on the back of the lights. This allows individual lights to be daisy-chained together so that only one of the lights needs to be connected to a power outlet. Currently, the Mars II lights are our preferred series of Mars Hydro grow lights as they incorporate many of the technical specifications desired in a grow light. In addition, the Mars II lights come in a sufficiently wide range of sizes to cater to a wide range of home indoor gardening needs from a few potted plants right up to small grow room-sized areas, and also have the ability to be daisy-chained together to cover the even larger grow rooms out there. ​​The latest series of LED Grow lights from Mars Hydro is the ECO series which incorporates characteristics from the previous two series that the company sells. Size-wise, the Mars Hydro ECO lights are of a similar size to equivalent lights from the older Mars Hydro series and they are designed to cover similar-sized growing areas. However, a key difference between the older series and these newer lights is that the ECO lights use significantly less energy than ​their predecessors with the 300W ECO light consuming only 99W and the larger 600W light requiring about 191W of power. Unfortunately however, although the lower power consumption is great for helping to keep electricity bills under control, it comes at the expense of light output from the ECO lights with them emitting reduced amounts of photosynthetically active radiation (PAR). The technical specifications of the ECO lights, on the other hand, are more similar to the specifications of lights found in the Mars II series. As with the bigger lights from the Mars II series, the ECO lights cover the wider range of blue wavelengths starting from 400nm and going up to 460nm, while the red light is in the 630-660nm wavelength range. In addition, like the Mars II lights, the new ECO lights also incorporate LED bulbs that emit in the 730-740nm far-red wavelength range along with white LEDs that have a colour temperature of 2700K to 3000K. Like the Mars II series, the ECO series can also be daisy-chained together when larger grow areas need to be covered and as a consequence do not require multiple electrical outlets to power each light. Overall, the Mars Hydro ECO lights are a reasonable set of grow lights ​that are best used when power usage needs to be kept to a minimum. However, the lower power consumption of the lights does come at a light output cost which does not seem to be such a great trade off unless you are growing plants that do not need the higher light levels of Mars Hydro’s earlier generations of LED grow lights. 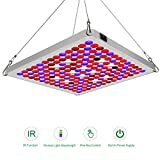 ​The 90W UFO LED grow light sold by TOP-MAX on Amazon is a relative newcomer to the LED grow light scene in the UK, and preliminary reviews suggest that this is a lamp that works well for growing plants. It has some of the same features as the TaoTronics TT-GL05 (see below), which we know works well. In particular, the outer casing is almost identical with three fan ports and hanging wire assemblies almost identical to the TaoTronics light. In addition, the types and ratios of the constituent LEDs contained within the light are the same red (630nm), blue (460nm) and orange (610nm) colours at a 7:1:1 ratio, as with the TaoTronics light. However, the similarities are only aesthetic for now and we don’t really know the source of the LED bulbs themselves which is an important factor when considering lamp life - so buy with caution. 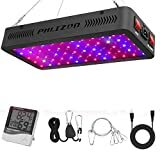 ​Currently, this is one of the top choices for LED grow lights available on Amazon in the UK that is reasonably priced for the average consumer. The TT-GL05 light is sturdily-constructed and uses 35 red (630nm), 5 blue (460nm) and 5 orange (615nm) LEDs, and it is designed to cover an area of 2 feet x 2 feet (60cm x 60cm) but you can double that area if you are using it within an internally-reflective enclosure such as a grow tent. In fact, a light-sealed enclosure may be necessary for some people as it is very bright to the point of potentially being bothersome if used within an open living space. It has 3 fans inside its structure to keep it cool which may sound a lot for a UFO light, but cool-running LEDs means they will last longer. It runs at about 30oC even in an enclosed space. The fans run continuously, but are reasonably quiet that they will barely be heard if the unit is used within a grow tent or similar. Because of the predominance of red LEDs, this light works better for the flowering part of a plant’s life-cycle rather than for its vegetative growth phase placing a limit on plant height but it can still be used for some decent early growth. To see how well the TaoTronics TT-GL05 performs with a variety of plants, see the Grow Diaries page. ​Although most people have used this particular model for extended periods of time (even a couple of years) without any issues, as with any technology, there are always some bad individuals within the group. However, the positive reviews available on this LED grow light indicate this happens only occasionally and the Amazon seller (Sunvalleytek-UK) is very responsive in getting things sorted out while the light remains under warranty (and one can always fall back on that great Amazon safety net). Therefore, it is important to use the light as much as possible relatively early on so that you can reduce the chance that any defective units go unnoticed before the warranty period is up. ​The TaoTronics company itself is headquartered in California so you can rest assured that this is a quality company with a reputation to protect. In fact, their LED ​plant lights are quite popular in the US particularly for the home ‘indoor garden’. They sell several other LED grow light models, but they are not all available yet in the UK. The company also makes several other types of unrelated technology products including LED lighting for other domestic uses, some of which we have personally used like their LED Desk Lamp, which is well designed and operates flawlessly, and their LED grow lights are similarly decent bits of kit which will do what they are supposed to. ​Update: TaoTronics has informed us that, due to lacklustre sales of the TT-GL05, they are no longer selling it ...now that's really ashame! 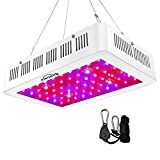 ​The QueenshinyLED brand of grow light is probably one of the more common ones that you will find on Amazon. The company behind the brand is the Shanghai QunXin Tradng Company which sell a number of different QueenshinyLED grow lights which vary in size, power and wavelength clearly in an effort to cater to a wide range of growing needs. All the lights appear to have been manufactured in China (mind you, isn't everything these days!) as you can buy the same lights on Aliexpress / Alibaba. How reputable the QueenshinyLED brand is, is anyone's guess but a recent smattering of reviews have looked favourably upon it, so we are now more encouraged to give them a try. This particular UFO version comes in a number of different power ratings of which the 135W or the 147W versions are of particular interest to me. The light spectrum they cover is quite impressive with LEDs covering the violet/blue band, as well as across the orange/red to far-red range. Once again, in an effort to compete with other lights on the market, they have also included undesirable white LEDs. All the LEDs are 3W LEDs, which is preferred (over puny 1W bulbs or the less efficient 5W LEDs) but they never indicate whether they are from a reputable manufacturer. The problem with that is that we just don't know how accurate the 50,000hr lifespan claim will be and we might just end up either having to replace the LEDs in short order or chucking the light for a more reputable one, so do purchase with that risk in mind. ​2014 Update: Although the characteristics of this light are one of the better ones out there, a couple of recent reviewers suggest that the constituent LED grow bulbs on this batch being sold here in the UK may not last more than a few months, which may in part be due to the fact that the company have not made this light for quite some time. Consequently, we would be very cautious about buying what must now be the last remaining stock available. ​This light is sold through Amazon, and although there is a minor discrepancy with its product listing, we actually quite like what we have found out about it. The grow light was originally produced for Lighting EVER, which appears to be a reputable company that sells other LED lighting products both in the UK and in the US. This product was originally dispatched directly from Hong Kong (the original manufacturer?) but now some savvy entrepreneur has picked up a bunch of them and is dispatching them directly from a UK-based location. Lighting EVER itself sells these and other LED grow lights through its UK website, but we much prefer ​to buy it within the safety of the Amazon ecosystem . 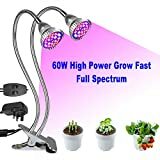 It currently has 2 Amazon reviews and they are both very positive which is very encouraging since a lot of other LED grow lights either have no reviews or bad ones. The light uses reputable brand-name LEDs including 660nm red, 640nm blue and 610nm orange at a ratio of 7:1:1. We particularly like the fact that white LEDs have NOT been incorporated into this product as you so often see with other LED grow lights – if you have read ​our page on white LEDs then you know that we are not a fan of them. They say that the light produced is equivalent to a 400W HPS or MH light, which seems a bit of an exaggeration to us for a 90W UFO, and they have also made a typo in the product description listing the product as containing ‘Red, blue and white‘ LEDs when we think they meant to say ‘Red, blue and orange‘. Anyway, overall, we actually quite like this LED grow ​lamp at least for a first-timer who is just starting to dabble in LED grow lighting technology. ​​A quick word about LED grow lights from Dormgrow. Although this is a US-based manufacturer, so not as accessible as other sellers from the UK, they do ship to the UK with the correct UK electrical plug. But the main reason why we mention them is because they have incorporated true UV-B LEDs into their design, something that we have not found in many products from the UK. Although we like the panels, we should say though that we are NOT a fan of their UFO lights, mainly because they lack UV and far-red LEDs and they also incorporate some undesirable yellow wavelengths, however, their larger panels have both UV-B and far-red wavelengths which are not commonly found in LED grow lights. Once again, we do have to live with the ever-present white LEDs which we don't like but its worth it since ALL the desirable wavelengths are included, and anyway, these days you will be hard pressed to find lights that don't incorporate white LEDs. This LED grow ​lamp made by Prakasa is available from a number of places including Amazon.co.uk. Although this light has a number of good things going for it (fans, reputable brand-name LEDs, etc), not to mention the large availability of reliable information that you can get about the light, there are a number of things we don't like about it. Firstly, it includes the unwanted white LEDs, which as we have described before, is something to avoid if possible. Also, a couple of recent reviews on Amazon make it clear that they think ​the light is pretty useless compared to other LED grow lights. We also don't like a comment made by another seller we found (not the Amazon seller mentioned here) to 'minimise the distance between the grow lamp and the plant' - makes us think that they are already preparing excuses for why it might fail to deliver! This is one to avoid we think! ​"Growth and flowering boosters - Kessil H150 is an innovative range of high intensity blue and red LED grow lights that boost the results you get during vegetative growth and flowering. They work by supplementing the colour spectrum of your traditional HID and CFL lighting. Based on knowledge and technology used in the defence and military industry, Kessil LED grow lights are scientifically proven to improve plant development. Using the patented Dense Matrix LED™ platform, H150 effectively delivers penetrating and spectrum specific light directly onto targeted plants." ​Speaking of professional LED grow lights, here is a broad-spectrum LED grow light that falls into that category. Once again the hefty price tag gives it away, but it follows the old cliché of ‘you get what you pay for’. So if you are a serious grower, then you might want to consider shelling out the bigger bucks to get something that actually works. This unit is super-powerful with the ability to pull some 600W, it’s big too with the light covering a generous growth area. It also uses brand-name Helio LEDs , which are from a reputable Taiwanese manufacturer, although not as well established as the BridgeLux or Epistar brands. 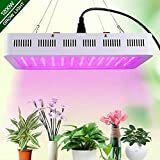 The Amazon seller is UK-based, which is always reassuring, but more importantly, the light itself was manufactured by FERO LED which is a reputable LED light manufacturer selling products in Europe and the US, so you can expect to get a pretty decent grow light. ​This model looks to be from one of their older ranges as FERO LED itself doesn’t sell it any longer, but older doesn’t necessarily mean less effective. Unlike most other grow lights, you have quite a bit of control over the type of lighting (ratios of blue to red) and the power that you can get from it. This is a useful feature if you know enough about your plants in order to adapt the lighting for different growing conditions. We don’t know the exact LED wavelengths used in the light, but it does cover the requisite red to far-red spectrum, and the blue spectrum. So really all we are missing is some UV light that for a lot of plants you can get away without. Unfortunately, like most other LED grow lights, they have also felt the need to incorporate white LEDs, which would be preferable to avoid but which one can live with. As for cooling, this is effectively achieved with 6 high-quality fans. Overall, if you are willing to pay the price, this light would provide a good return on investment.